I decided to pick up this much talked of novel before it was announced that it was the winning book in the Baileys Women's Prize for Fiction. I wasn't sure what to expect as the premise leaves you pretty unprepared for what lies within. Narrated by a young woman, this is a coming of age novel about the protagonist's relationship with her brother who is diagnosed with brain cancer as a child. The fallout of this diagnosis reaches through the years influencing her adolescence and place within the family. This is most certainly not an easy read and the narrative is wonderfully disjointed with a musicality of language which reminded me of Joyce's Ulysses. While the sentence structure strays a far way from what we would expect, I would compare the experience of reading this to that of reading A Clockwork Orange. It might take a bit of time to get into it, but once I got used to the rhythm of the language it began to make a lot more sense. What comes to light is an intensely emotional novel which is raw and painful. As the young woman in the story seeks sense in a world which has been unkind to her, she begins a variety of sexual relationships which act as escape from the pain she carries with her. As the novel progresses and her brother again becomes ill she tries to shake off the view her mother has of her, instead wanting only to care for her brother. 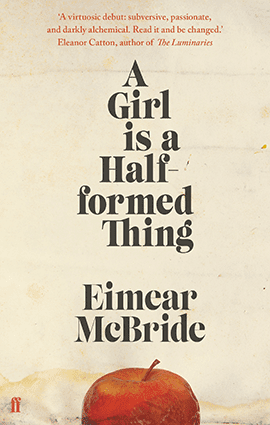 I don't want to spoil the story for anyone, though as the book reaches its heartbreaking conclusion, McBride achieves an intensity of feeling that is rare in contemporary fiction. The structure of the language compounds the impact of the book. It is a challenging read and wholly deserving of the critical acclaim it's received.